It’s getting to be that zucchini time of year again and when I checked my recipe index I couldn’t believe that after all this time I haven’t yet posted a recipe for zucchini bread. So if you’re thinking about zucchini (and really, aren’t we alll?) you’re going to love this simple, moist and flavorful classic version! Okey, dokey— let’s talk zucchini. Are you a fan? I don’t think we ate it much growing up, but my home panel of judges and I love it, whether it’s used in a savory way like in these Baked Zucchini Sticks, Skinny Cream of Zucchini Soup or Zucchini Slaw or tossed into a sweet treat like in these Cranberry, Zucchini and Carrot Muffins. Like it or not, you cannot deny that this is one versatile veggie!! When you bake up a loaf of this it will make your house smell terrific! 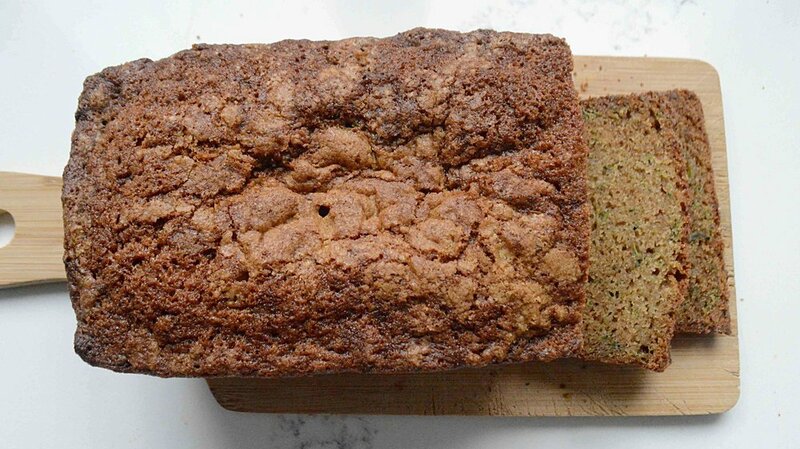 This zucchini bread is one of the treats I wanted to include at the shower I threw a couple of weeks ago, but alas it did not make the cut. But not because it’s not one of my favs—I just had to stop somewhere. But I so want you to have this in your repertoire, especially if you grow your own zucchini and can’t keep up with the abundance of it. And if that’s the case, bake up a loaf or two of this and drop off extra zucchini at my doorstep—no matter what, we can’t seem to grow our own and I'm desperate to make this bread again!! 1. Preheat oven to 350º F. Spray a 9x5-inch (or about that size) loaf pan with nonstick vegetable spray and line the bottom with a piece of parchment paper. Set aside. 2. In a medium bowl, whisk the flour, baking soda, salt, baking powder and cinnamon together and set aside. 3. Use an electric mixer on medium speed to mix the butter and both sugars together until light and fluffy for about 3 minutes, scraping down the bowl as necessary. 4. In a separate small bowl, whisk the oil, eggs, vanilla and zest together. Add 1/3 of the dry ingredients to the butter/sugar mixture and beat at medium speed. Then add ½ of wet ingredients and mix. Add another ⅓ of dry ingredients and mix and then the rest of the wet ingredients. Mix again and add remaining dry ingredients. Scrape down sides of bowl with rubber spatula. Fold in zucchini. 5. Pour the batter into the prepared pan and smooth the top. Bake for about 1 hour but check at 50 minutes, as all ovens differ. Bread should be golden brown on top and a tester inserted into the center should come out clean. If there is still batter sticking to tester, bake it a little longer and test again. 6. Cool in pan on a wire rack until completely cool, then slice and serve. Well wrapped, the bread will keep well at room temperature for about 5 days. Note: Recipe adapted from Sweet by Valerie Gordon.